I always follow strict cleanliness & sanitation procedures to ensure that all of my implements & equipment is CLEAN & DISINFECTED. Incorporating hot towels & aromatherapy with firm, relaxation techniques. For 15-30min massages, you choose the focus area(s). For 45mins+ massages, we focus on the full body. Includes a relaxing soak with lavender essential oil, peppermint infused salts, and a stimulating peppermint foot scrub. Incorporating hot towels, we massage the feet & legs using acupressure & Swedish massage techniques to increase circulation & relax tired, achy feet. It will also help reduce any swelling and/or water retention! If you've never had a hot stone massage, you need to try it. We incorporate the stones throughout the massage; lingering long enough to heat up your muscles & melt away any tension. A combination of hot & cold stones are used for placement in key areas to target specific concerns. 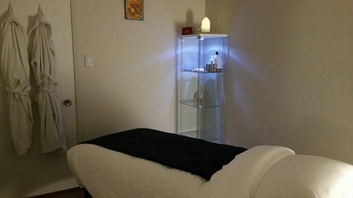 If you have any concern areas, please let your Esthetician know BEFORE we start the massage. Includes a balancing cleanse, triple action exfoliation (using a body scrub formulated with fruit enzymes, AHAs & walnut shells), hot towel steam, extractions, back/neck/shoulder massage, and a moisturizing masque application; finished with a moisturizer. Enjoy a neck/scalp & foot massage while your masques sets! Combine waxing services & get $5-15 off! Please arrive with hair trimmed to approximately 1/4"-1/2" in length. *Bikini & Brazilians are offered to women only.